Mildred Cleone Haynes Hodges, known as Cleone Hodges (July 11, 1909 – September 9, 2012), was from 1938 to 1974 a professor of Health, Physical Education, and Recreation at Appalachian State University in Boone in Watauga County, North Carolina. An article in The Watauga Democrat newspaper published a month before her death at the age of 103 referred to Hodges as "among the most loved of local residents — and a liberated woman long before the term was coined." Hodges was born in the village of Shongaloo in Webster Parish in northwestern Louisiana, to Oscar Henry Haynes, Sr., and the former Mary Lynn Burns (1889-1971). O. H. and Lynn Haynes relocated south to Minden, the seat of government of Webster Parish. Haynes, Sr. was elected Webster Parish sheriff in 1933 and served in that position until 1952. His son and Cleone's younger brother, O. H. Haynes, Jr., held the same position from 1964 to 1980. Hodges had two other brothers, J. Y. Haynes and his wife, the former Edith Henry, both deceased, and Delmus Wells Haynes (1918-1919), who died prior to his second birthday. Hodges first attended Northwestern State University, then Northwestern State College, the state teacher training institution in Natchitoches, Louisiana. She then enrolled for graduate studies at Louisiana State University in Baton Rouge. There she was an LSU Lady Tigers basketball player and once competed against the Olympian Babe Didrikson. Hodges was hired at Appalachian State by the first chancellor that the university ever had. She was long active in the First Baptist Church of Boone and was a life member and past president of the Rhododendron Garden Club. After retirement from Appalachian State University, she was for twenty-three years the secretary of the Watauga Parks and Recreation Commission and served as well on the Boone Town Beautification Committee. Athletic like her younger brother, O. H. Haynes, Jr., who played football for Minden High School in the late 1930s, and his son, Freddie Lynn "Fred" Haynes, who quarterbacked the MHS Crimson Tide and the LSU Tigers in the 1960s, Hodges turned to golf when her son, J. B. Hodges, played the game in high school. She was a member of the Blue Ridge Golf Association, the Blue Ridge Ladies’ Golf Association, and the Boone Golf Club, at which she won the championship in 1975. For years, she participated in the Senior Games at local, state, and national events and won eight Gold Medals. She scored the third of her career hole in one at the age of ninety three, when she retired from the sport. Hodges was also an artist, whose oil paintings depict the Appalachian High Country. Hodges was divorced from the late Jack A. Hodges. 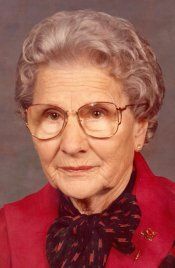 In addition to her son, she was survived by two granddaughters, Erin Hodges-Demas and Alyssa Hogan, both of Hickory in Catawba County, North Carolina; three great-grandchildren, and her sister-in-law, Freddie Louise Walker Haynes (1924-2017) of Minden, Louisiana, the widow of Sheriff O. H. Haynes, Jr. Hodges died at her residence and is interred at Mountlawn Memorial Park and Gardens in Boone. In 1987, the Cleone Haynes Hodges Scholarship was established in her honor to support Appalachian State University students in the College of Health Sciences. In 2005, Hodges was inducted into the Watauga County Sports Hall of Fame. In 2012, on the occasion of Hodges's 103rd birthday, U.S. Representative Virginia Foxx of North Carolina's 5th congressional district rose to the House floor to offer a tribute to the retired professor and civic leader. ↑ Faculty Deaths. issuu.com. Retrieved on September 15, 2014. ↑ Cleone Haynes Hodges. Minden Press-Herald. Retrieved on September 14, 2012. ↑ 3.0 3.1 3.2 3.3 3.4 3.5 3.6 Sherrie Norris (July 7, 2012). Cleone Hodges celebrates 103 years of life. Watagua, North Carolina, Democrat. Retrieved on September 15, 2014. ↑ Hodges's grandparents were John Oscar Haynes (1848-1918), a native of Georgia, and his second wife, the former Julia Ann Butts (1862-1935), and Andrew Jackson Burns (1851-1946) and Isabelle Burns (1853-1910). ↑ Sandwiched between the two terms of O. H. Haynes, Sr., and O. H. Haynes, Jr., was their Democratic intraparty rival, Sheriff J. D. Batton. ↑ Mary Lynn Burns. Wiley Family of Shongaloo. Retrieved on September 14, 2014. ↑ John Oscar Haynes (grandfather of Cleone Hodges). findagrave.com. Retrieved on September 15, 2014. ↑ 8.0 8.1 Cleone Hodges Scholarship. healthsciences.appstate.edu. Retrieved on September 25, 2014. ↑ 9.0 9.1 Cleone Hodges, Died September 9, 2012. High Country Press (September 12, 2012). Retrieved on September 15, 2014. ↑ John A. Agan (2002). Minden: Perseverance and Pride. Charleston, South Carolina: Arcadia Publishing Company. ISBN 9781439630532. Retrieved on September 1, 2014. ↑ 11.0 11.1 Recognizing the 103rd Birthday of Cleone Hodges. Thomas.loc.gov (July 10, 2012). Retrieved on September 15, 2014. ↑ Cleone Haynes Hodges. Findagrave.com. Retrieved on September 15, 2014. This page was last modified on 1 April 2019, at 09:03.